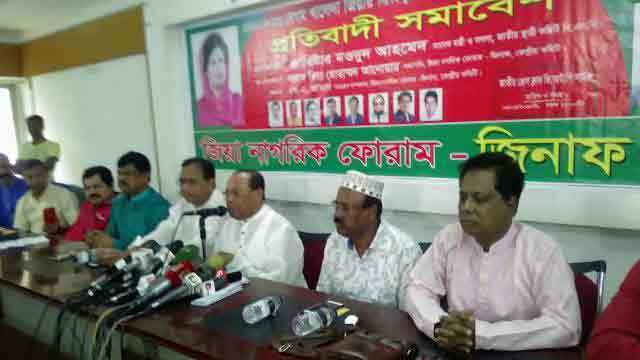 Dhaka, Mar 23 (Just News): Main opposition Bangladesh Nationalist Party (BNP) will win the next parliamentary polls by a margin of 75 per cent seats if the election is free and fair, the party's standing committee member Moudud Ahmed said on Friday. He made the forecast, citing the landslide victory of the pro-BNP panel in the just-held Supreme Court Bar Association (SCBA) election. "If the next general election is held in a free and fair manner like that of the Supreme Court Bar, the difference of percentage in seats to be secured by the BNP and the Awami League will be 75," Moudud predicted, addressing a protest programme. It was organised by pro-BNP group Zia Nagarik Forum at National Press Club, demanding release of BNP chairperson Khaleda Zia, now jailed in a graft case, and an atmosphere for participatory general elections. The pro-BNP panel led by current president Joynul Abedin and general secretary Mahbub Uddin Khokin swept the Bar elections as results were announced on Friday. Pro-Awami League won only four posts compared to the pro-BNP panel's 10 posts, all leading ones. Moudud, himself a senior lawyer, said the Bar election results are indicative of the public support towards the BNP. The BNP leader also mentioned that the opposition party would launch movement should the ruling party continue to ignore their demand for holding a free, fair and participatory general elections under a party neutral administration. Dwelling on the country's graduation from the LDC status, Moudud said development is meaningless unless there is democracy. "True development is not possible without development. Bangladesh would have attained the status of developing country 6-7 years ago, had the BNP been in power," he added.